Of the 300-plus species in the frog family Dendrobatidae, only three members of the Phyllobates genus have been documented as having their poison used for hunting darts: Phyllobates aurotaenia (a.k.a. Kokoe), Phyllobates bicolor (a.k.a. Black-Legged) and Phyllobates terribilis (a.k.a. Golden). While in the wild these frogs harbor poison sufficient to kill a grown man, after they have been held captive for a time, they lose their toxicity. So what’s going on here? It turns out, the poison in these animals does not appear to be created by the frogs themselves, but rather is believed to come directly from their diets and then is secreted, unchanged, from glands in their skin. The poison itself is primarily made up of three steroidal alkaloids: batrachotoxin, homobatrachotoxin and batrachotoxinin A. Together, these toxins affect both nerves and muscles primarily via messing with the normal function of voltage-gated sodium channels, causing a range of effects including cardiac arrhythmias and even heart failure. So what do they eat to acquire these toxins? As an example, Golden poison frogs are known to feast on certain species of Brachymyrmex and Paratrechina ants, as well as some Choresine beetles, including Choresine pulchra and Choresine seiopaca. Recent scholarship has shown that the latter (the Choresine beetles) contain forms of BTX-A (BTX = botulinum toxin) as well as the aforementioned batrachotoxinin. When spending their lives in laboratories and zoos, however, these frogs are typically not fed the toxic beetles, but rather eat fruit flies, mealworms, crickets and termites- none of which contain the alkaloid toxins. Further backing up this diet theory is a study done by Dr. John W. Daly, in which he fed a group of captive Dendrobatidae frogs that were initially not toxic a diet of arthropods containing the offending alkaloids. Later, those toxic compounds were excreted by the frogs’ skin unchanged from their pre-ingested form. The moniker “poison dart frog” comes from the fact that certain peoples have used the toxins excreted by the frogs as a coating for their weapons, particularly things like the tips of blow gun darts. The method by which people obtain the poison depends on the type of frog. For both Kokoe and Black Legged poison dart frogs, because their levels of the toxins are not as high as the Golden (17-56 mcg per frog vs. 1,900 mcg for the Golden), the caught frogs are stressed (either by simply impaling them on sticks or first heating and then spitting them). This stress results in an increase in toxic secretions, which are applied by rubbing the weapon on the skin. The Golden poison frog, being significantly more toxic, escapes the torture suffered by the other two, and simply has darts rubbed on its back. 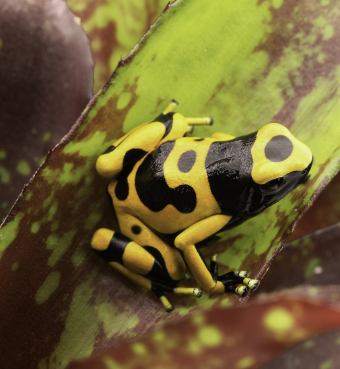 The poisoned darts are typically used for hunting rather than human warfare, although it should be noted that these specific poison dart frogs’ secretions could be lethal to humans, with a lethal dose being as little as 2 mcg. All three species of Phyllobates are native to the rainforests of South America, where they are elusive and their lives are not well-documented. For example, it’s not clear precisely how each species breeds, although the general process is that the female apparently lays a clutch of eggs that the male or males “moisten” periodically, and their tadpoles hatch within two weeks or so. When this happens, the tadpoles swim onto the male’s back and then are more or less temporarily stuck there via a mucus secretion. The male then goes looking for a suitable place to deposit the tadpoles to finish their development. A good location is simply any small pool of water- even something like a coffee cup of water would be sufficient. Once the location is found, the male leaves the tadpoles in the water and from this point on, they are on their own and take a few months to mature into frogs. Depending on the species, males grow to between 32mm and 45 mm, and females from 35 mm and 47 mm. Golden poison dart frogs are thought to typically live about five years in the wild, benefiting greatly from the fact that there are few predators that will mess with them. In fact, beyond all three highly toxic species being brightly colored, a characterization that is thought to warn away predators, they also rarely show signs of fear when approached and will not attempt to hide, unlike most animals their size when a much larger animal approaches. That said, there is a species of snake, Liophis epinephelus, that is sufficiently resistant to the poison that it will take a chance and occasionally eat one of these frogs. Poison dart frogs aren’t the only ones that can safely consume batrachotoxins and then subsequently use the poison to their advantage. For instance, the hooded pitohui bird is known to secrete this toxin through its skin and onto its feathers. Like the poison dart frogs, these birds get the poison from feeding on certain insects that have it, such as Choresine beetles. Bonus Fact #1 says “the caught frogs are stressed (either by simply impaling them on sticks or first heating and then spitting them). ” Do you mean spitting frogs or splitting frogs? Or something else? That’s very interesting! I did not know that. Yes, interesting indeed. Makes me think an easier way to harvest spider venom, which it very difficult because of the size of the spiders… have a batch of frogs around, then grow the desired spiders in large quantities, feed them to the frogs and finally wipe out the excreted poison from the frogs’ back.